This article is part of an occasional series on ‘The Political Aesthetics of Power and Protest,’ the subject of a one-day workshop held at the University of Warwick this September. Democracy, since it does not function through command or coercion, requires instead a constant renewal of sets of symbols - symbols which appeal to people and instil in them a sense of belonging and identification. Increasing disenchantment and disillusion with the state, with political institutions, their practices and performance, makes it more important to explore the place of this aestheticisation of political language, the aesthetics of protest as well as of power. 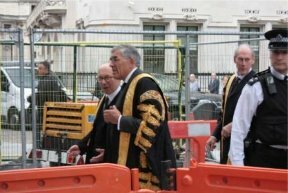 The judges of the UK Supreme Court in their gold-decorated ceremonial robes of office were on the pedestrian crossing, sandwiched between the ordinary paraphernalia of road works. With great nonchalance they dodged between a jumble of pedestrians and turned right into the gated space of the Abbey’s grounds. Calm descended on their progress as they now moved in a more orderly fashion, receding from view against a backdrop of the Abbey’s raising buttresses and gothic arches. 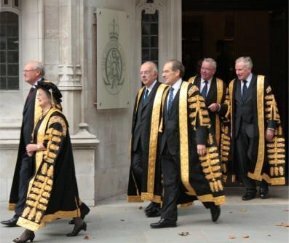 The first occasion I encountered these gilded judges crossing the road was on the October 1, 2009, the first day in the life of the UK’s Supreme Court. The second time was the October 3, 2011. Both dates were the occasion of what is an annual event, the ‘Judges Service’ at Westminster Abbey. It is a religious service that marks the start of the legal year. The judges of the UK Supreme Court walk in their ceremonial judicial robes from the courthouse on Parliament Square to Westminster Abbey and join a congregation of other judges drawn from all levels of the court system to participate in a ceremony described on the Abbey’s website as having, ‘...roots in the religious practice of judges praying for guidance at the beginning of the year.’ It is a custom said to date back to the Middle Ages. 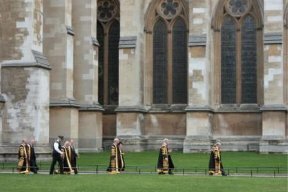 Following the service, all the judges process from the back of the Abbey to the Palace of Westminster to take part in the Lord Chancellor’s ‘breakfast’. Both service and breakfast are ‘private’ events. But, as my photographs record, there are aspects of these events that take place in public. I attended these events because of my interest in the production, management and use of judicial images. Various scholars have noted that the status and authority of judges is in part premised upon ‘image politics’. My research has explored a variety of images, some visual and some textual. It has taken me in some unexpected directions. These include a study of hagiographic scripts prepared and performed at swearing-in ceremonies to inaugurate and celebrate the appointment of new judicial office holders. These texts take the form of what might best be described as life writing (biography and autobiography). They offer textual portraits of the newly appointed judge as a State official. As such they have a double function: they formulate and fashion the subject not only as an exemplary individual, but also as an individual whose personal history makes manifest the virtues of the judicial institution. Each swearing-in script makes and makes public the values and virtues of the institution of the judge. These virtues are also depicted in painted and photographic judicial portraits. The portraits draw upon a particular aesthetics associated with institutional portraiture and traditions of representation associated with the depiction of social and political elites. They picture the judge’s double body, both physical and metaphysical - an individual who embodies the judicial virtues and qualities of the sovereign and of the body politic. Pose, costumes, background and props (predominantly books) all fashion the corporeal display of legitimate power, authority, and justice. These elements conspire to present the judicial body as a symbol of majesty, selfless dedication, and timelessness. Notably, these portraits serve to reinforce values internally; they grace the walls in and around courtrooms and other legal institutional settings. Like hagiographic scripts and judicial portraiture, the Judges’ Service involves image-making and image-management. Unlike those other forms, however, elements of the Judges’ service take place outside legal settings. If the courtroom is the traditional setting for the performance of judicial authority, then the appearance of the judiciary on the street strips away that institutional setting. Judicial image-making and image-management meets the heterogeneous and unpredictable visual life of the city; with what effect? Cameras are banned in most courts and when present are strictly controlled. The Judges’ Service provides a rare opportunity to produce a visual record of live judicial image- management in practice, outside those particular restraints. It is October 1, 2009 shortly before 11.00 am. Two male figures emerge from the gloom of the doorway of the UK Supreme Court. They are dressed in long black robes edged in gold. The extended sleeves are lavishly decorated with elaborate gold filigree bands. Another two (one a woman) follow, then another two until there are ten in all, a line of five pairs. Only one wears a hat. Underneath the robes each judge wears an almost identical wardrobe of business attire. There is no hesitation in their step; movements are swift and determined. The gilded figures seem to have eyes only for each other. Spectators in front of the court and en route appear to be unacknowledged. There is another group of the judiciary nearby — on the forecourt before the entrance to Westminster Abbey. The judges congregate beneath a towering white wall of Portland stone, pierced by a deep-set pointed arch doorway surrounded by a complex array of statute filled niches. The judicial figures appear to be organised in a series of small interconnected groups. The judicial robes being worn here are more diverse, more colourful, creating a juxtaposition of blocks of black, scarlet and white with ribbons and scoops of lilac. Many heads are covered by what look like grey ribbed woolly helmets. Faces are in general obscured. It is a more static scene. Groups of judges slowly ebb and flow. New participants emerge from shiny black cars. Existing members drift in the direction of the Abbey entrance. Most judges face each other, presenting their backs to those who are outside the security barriers. Only occasionally does a body or head turn to reveal a face. ‘Spectacle’ seems to capture a key characteristic common to both scenes. Both emphasise the visual display of symbols. In the first case, the ten matching black brocade robes, cut and decorated in an archaic style associated with the office of Lord Keeper of the monarch’s seal provide the perfect modest background against which to present the sumptuous display of precious metals. Elaborately woven gold bands cascade down the elongated sleeves and edge the garment. At the top of the sleeve is a golden crescent into which is woven four heraldic elements that make up the court’s official emblem: a five-petalled wild rose, the green leaves of a leek, a purple thistle and a light blue five-petalled flax flower. The high quality of the cloth, the precious nature of the materials used in the decoration, and the quality of the craftsmanship are all part of the display. The robes also have another symbolic function. They shroud their occupants, producing indistinct mannequins, human surfaces upon which the symbolic value of the adornments is mobilised. At the same time that those adornments obscure the wearers as individuals, they show the wearer’s institutional character and elite status. The individual who carries the symbols is invested with the qualities and characteristics they represent. The judges’ gestures and affect also form part of the symbolic assemblage. Each judge is preoccupied entirely with his fellow judges, while appearing to maintain an air of general indifference to the public spectators. This type of posturing works as an embodied sign of institutional distance. The judges’ internal focus captures the virtue of judicial independence, the quality of individual subordination and dedication to the judicial institution and to the law. The other scene, before the Abbey, has similar symbolic content, but its aesthetics differ. It is not so much a procession but more a tableau vivant. It is like a Rembrandt group portrait or a genre painting representing an intimate scene from daily life. The juxtaposition of the multiple groups and figures within each group, the inter-relationship of bodies, gestures, gazes, costumes, props, and backdrop draws the spectator into the scene to contemplate the figures and to make sense of their meaning. These two public appearances are exceptional by virtue of occurring outside the courtroom. The history of courtroom design in western liberal democracies reflects the extent to which architectural structures in courtrooms are developed to support the performance of judicial authority. Current courtroom design guides reveal the centripetal dynamic of these spaces. Each part is organised in relation to the judge. Sight lines, distances, levels, place the players in the proceedings and orientate them towards this central, frequently elevated figure. The materials used, the particular textures, the use of light, the detail of the ornamentation, all are mobiles to express the judicial figure’s institutional authority. The spatial objective is the coherence of the place of authority and the various performances within it, under the sign of the judge. The locations of the procession and tableau vivant are quite different. Neither the route from the UK Supreme Court to the Abbey nor the space in front of the Abbey is dedicated to the display or performance of judicial authority. These spaces have a centrifugal dynamic. They have a heterogeneous quality. They sustain multiple competing and co-extensive functions. The position and movement of bodies within them is neither disciplined by reference to a single goal nor fixed according to the strict demands of a single hierarchical objective. Boundaries are not fixed or hermetically sealed but are contingent, fluid, bleeding from one into another consistent with the multiple functions that make up this complex place. While the immediate environs of the Abby are spaces that have been designed with a variety of State spectacles in mind, they also remain decidedly public areas. They are locations that make the performance of judicial authority more problematic; they make it simultaneously in place but out of place. This is captured in some of my photographs. The photographs document the way the spectacle of judicial authority competes with the everyday reality of these central London locations. It is an everyday reality that is already saturated with another spectacle - the spectacle of capitalist consumption. In front of the Abbey, the symbols of judicial authority compete with an advertising panel attached to a London bus that reads, ‘This place is so dead. Zombieland’. This juxtaposition humorously reveals the gap between the intended significance of the Judges’ Service and its reception in today’s London. 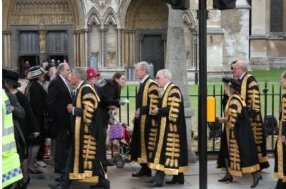 While for the Judiciary, the procession gains social and cultural significance from its medieval roots, in the context of London traffic the be-robed and be-wigged judges become just so many zombies. At another moment the passing bus advertising panel seemingly hovering over the judicial heads announces ‘Live a lunch of crime. You’ll feel like you robbed us’; a reference to a ‘meal deal’ at Burger King. These and other images in my collection all point to the co-presence of other forms of everyday spectacle and the blurring if not disintegrating boundary between the procession, the tableau vivant and all that surrounds them. A wide variety of effects may flow from these multiple competing spectacles. The scale of the spectacle of capitalist consumption diminishes the judicial spectacle and makes it appear out of date, old-fashioned. The judicial symbols struggle for visibility against the backdrop of these other everyday spectacles. Happenstance juxtapositions offer a potential for ironic commentary. Under the logic of capitalist consumption, the judicial spectacle is recuperated as a quaint quixotic minor tourist attraction’. This brings me back to the pedestrian crossing. It is the segment of the judges’ procession in which the exceptional symbolic display of judicial authority contrasts most sharply with the everyday. The road between the Court and the Abbey, the 200 meters known as ‘Broad Sanctuary’, is a favoured route for state-related processions. 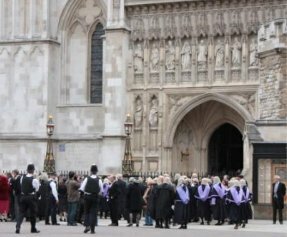 Yet, the judiciary’s procession in both 2009 and 2011 passed instead over the far more mundane pedestrian crossing to get to the Abbey. The decision to choose this route could have been based on logistical concerns, such as minimizing security risks and traffic disruption. Yet, by choosing to minimize the disruption to traffic, the judicial spectacle also becomes much easier to miss or ignore. Why choose to sustain an elaborate performance of judicial authority and then minimize its public impact? One reading of the incorporation of the pedestrian crossing into the processional route is that it reflects the relative unimportance of the third branch of government. This might be indicative of the decline in the status of the judicial branch of government. Several factors contradict such a reading. The extension of law over the last thirty years, regulating the minutiae of everyday life and death, formally recognising human rights challenges, providing opportunities to challenge the legality of government acts, all indicate that the political role of the judiciary is, if anything, increasing rather than diminishing. Moreover, factual and fictional representations of judges’ work on the news, courtroom dramas, and reality TV are popular media products consumed en masse on a daily basis. The eager consumption of these images via screen media in contrast to the lack of dedicated spectators for the Judges’ Service suggests not so much the decline and disappearance of spectacles of judicial authority from public view but rather a change in modes of consumption of judicial spectacle. Spectatorship of this form of State theatre is now mediated and at a distance. The decline in spectatorship of live judicial and court performances is an acknowledged part of contemporary society. While a great virtue continues to be made of the fact that court proceedings should as a general rule take place in public, and thereby be subject to public scrutiny, the spaces within the courts dedicated to public use are generally empty or are on increasingly rare occasions occupied by representatives of the media. The spectators viewing the ‘live’ performances of judicial authority that I am examining here were made up of a variety of occasional and accidental viewers. On the first occasion I witnessed the activities surrounding the Judges’ Service the media were out in force. The resulting images appeared in a variety of settings ranging from the Abbey’s website to news media reports. On my second visit there was a smaller media presence. 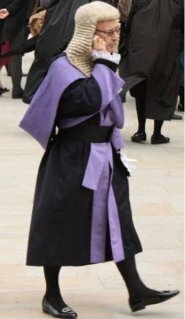 In 2011, one of the few people on the street watching the procession of judges leaving the Supreme Court on their way to the pedestrian crossing was a street sweeper of Westminster Council. He was joined by a few passing tourists and pedestrians. My work on judicial swearing-in ceremonies and judicial portraiture also suggests that it may be problematic to assume that ‘the public’ is the primary audience for judicial performances. The primary audience is more likely to consist of other judges and members of the wider legal community who have far more knowledge of these particular cultural practices. So why did the judges cross the road? 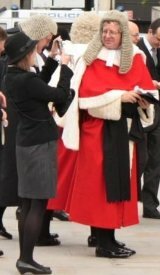 During the course of an interview in November last year, Lord Phillips, President of the Court, explained that ‘...judges are in fact ordinary, albeit intelligent members of society doing a job...’ In choosing the pedestrian crossing rather than Broad Sanctuary, the ‘ordinary’ is itself put on display as a virtue of the judicial institution. This choice offers a neat symbol of the integration of the judicial authority into the everyday. In contrast, the choice to disrupt traffic by processing down the street might have painted the judiciary, even to the eyes of the judges themselves, as outdated, remote and removed from the speed and the needs of contemporary urban life. Finally I want to turn to two images of judges who were part of the congregation of judges in front of the Abbey. One shows a judge being photographed by another person, maybe a judicial assistant or family friend. The other shows a judge on his mobile phone. 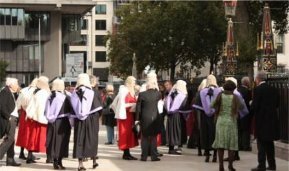 When the judges assemble on the forecourt of the Abbey, they are not yet formally involved in the performance of judicial authority. That performance is in a sense suspended in preparation for the main event that will shortly follow inside the Abbey. Once inside, the judges will formally have quite lofty dramatic responsibilities. One of the objectives of that ceremony is to align the State institution of judgment with the sacred, what Lior Barshack describes as the magical and the religious foundations of judicial authority. My photographs of the judges assembled before entering the Abbey capture a sense of time before the curtain call, of time spent backstage. Their affect in this moment appears more relaxed. They move naturally about the space. The performance of judicial authority is captured in the moment of becoming. The judicial performers are ordinary people in the process of preparing to go on stage. What is backstage to the Abbey and to the participating judiciary is front stage to spectators like myself who observe from behind the barriers. My photographs capture the fleeting moments: a judge smiling for an impromptu snapshot, another answering a mobile phone. What does it mean for the public to see their nation’s judges backstage? Does judicial authority collapse once its magical qualities are shown to have human animators? The Judges’ Service is an event which reveals the judiciary’s steep investment in the maintenance of its image, at the same time that this image, because of its public setting, is removed from what Beeman describes as its “special framed context” and subject to competing forces. While intending to stage the divine source of their own authority, the judges’ also incidentally reveal a rather human source, the labour of performance. This article forms part of an editorial partnership, funded by the Gendered Ceremony and Ritual in Parliament research programme at the University of Warwick and the Leverhulme Trust.